Transporters can help you handle your drivers holidays and periods of unavailability by using the inbuilt event calendar. In order to provide this you will need to setup a new Event Type. Go to Settings->Events->Event Types and then "Add Event Type"
Recommended settings are below, you can adjust if preferred. Save the event Type, then go to any supplier and click the Add Driver Holiday button that will now be showing. Set the Scheduled date as the start of the unavailable period, with the Deadline date as the end of the unavailable period. 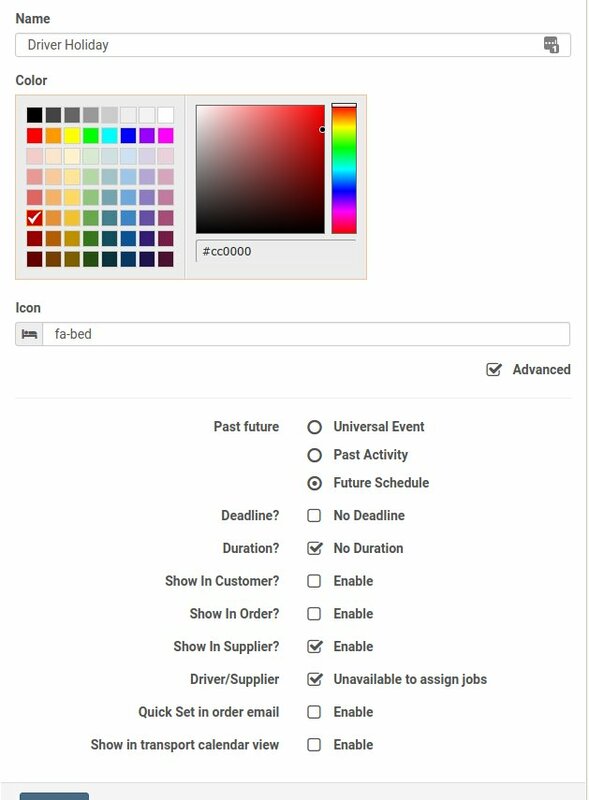 Now when searching for drivers to assign to an order that falls within these dates, the driver will be marked in red, with the event details shown on hover.